The design of this deck has come a long way, and I absolutely ADORE the way it came out! Probably one of my better archetypes, with a ton of polish to boot. While I feel it is not as powerful as some of the staple DP decks, it has a shot, if built right. Any advice? During either Player's Turn, if a Card(s) or Effect(s) Shuffles your Deck; You can Special Summon this Card from your Graveyard. You can Target 1 Monster you Control and 1 Face-up Card your Opponent Controls; Tribute that Monster, then return that Target to the Hand. If this Card is Destroyed; Destroy all "Necrovanyia" Monsters you Control. You may only Special Summon 1 "Necrovanyia" Monster per shuffle. You may only activate the effects of "Necrovanyia Alchemist" Once per Turn. During either Player's Turn, if a Card(s) or Effect(s) Shuffles your Deck; You can Special Summon this Card from your Graveyard. You can Target 1 Monster you Control and 1 Set Card your Opponent Controls; Tribute that Monster, then Destroy the targeted Card. If this Card is Destroyed; Destroy all "Necrovanyia" Monsters you Control. You may only Special Summon 1 "Necrovanyia" Monster per shuffle. You may only activate the effects of "Necrovanyia Assailant" Once per Turn. During either Player's Turn, if a Card(s) or Effect(s) Shuffles your Deck; You can Special Summon this Card from your Graveyard. You can discard this Card; Add 1 "Necrovanyia Cathedral" from your Deck to your Hand. 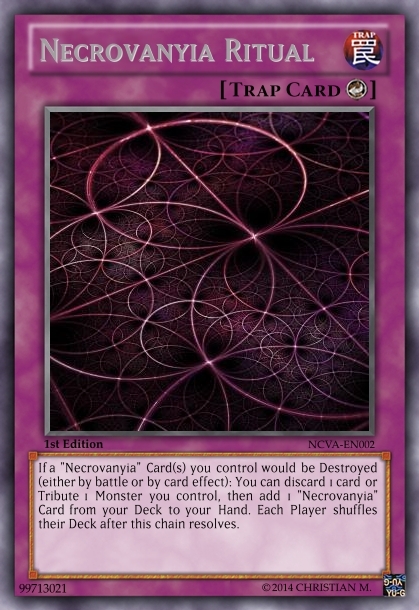 If this Card is Destroyed; Destroy all "Necrovanyia" Monsters you Control. You may only Special Summon 1 "Necrovanyia" Monster per shuffle. You may only activate the effects of "Necrovanyia Caster" Once per Turn. During either Player's Turn, if a Card(s) or Effect(s) Shuffles your Deck; You can Special Summon this Card from your Graveyard. If this Card is Summoned; You can send 1 "Necrovanyia" Card from your Deck to the Graveyard. If this Card is Destroyed; Destroy all "Necrovanyia" Monsters you Control. You may only Special Summon 1 "Necrovanyia" Monster per shuffle. You may only activate the effects of "Necrovanyia Sorcerer" Once per Turn. Cannot be Normal Summon/Set. During either Player's Turn, if a Card(s) or Effect(s) Shuffles your Deck; You can Special Summon this Card (From your Hand or Graveyard). If this Card is used as a Synchro Material, Banish it. 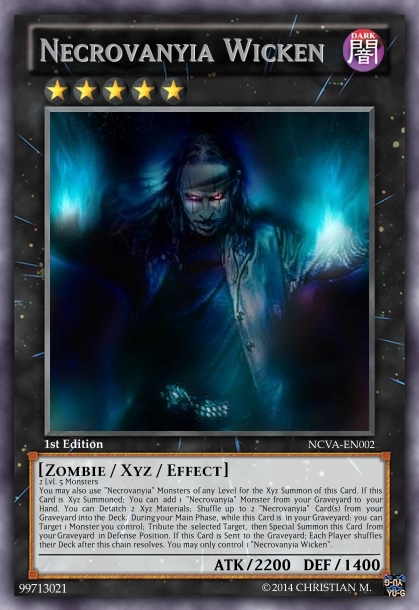 During Ether Player's Turn, After this effect resolves; you can Synchro Summon 1 Dark Monster, using Zombie-Type Monsters you control (This is a Quick Effect). If this Card is Destroyed; Destroy all "Necrovanyia" Monsters you Control. You may only Special Summon 1 "Necrovanyia" Monster per shuffle. You may only activate the effects of "Necrovanyia Tamer" Once per Turn. 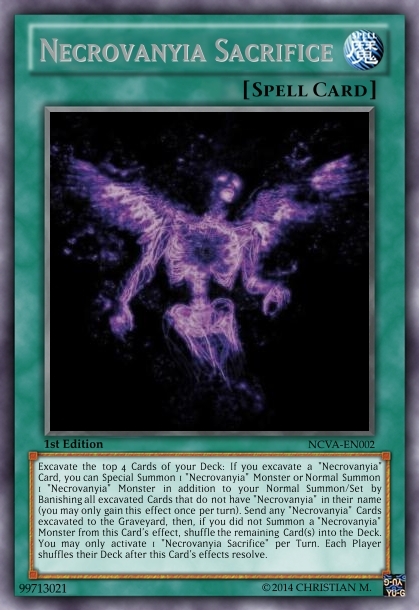 You may also use "Necrovanyia" Monsters of any Level for the Xyz Summon of this Card. If this Card is Xyz Summoned; You can add 1 "Necrovanyia" Spell/Trap Card from your Graveyard to your Hand. 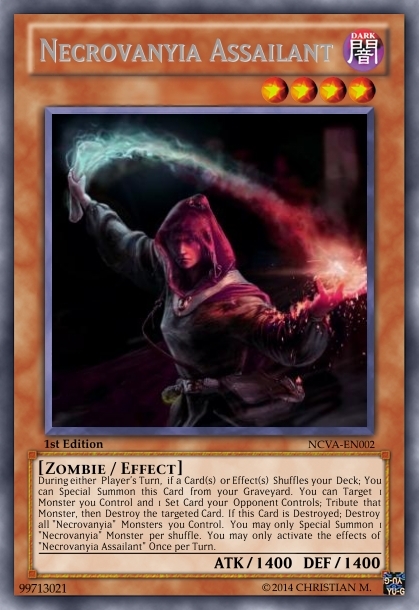 You can Detatch 1 Xyz Material; All Zombie-Type Monsters you currently control gain 300 atk. If this Card is Sent to the Graveyard; each Player shuffles their Deck after this chain resolves. You may only control 1 "Necrovanyia Priest". 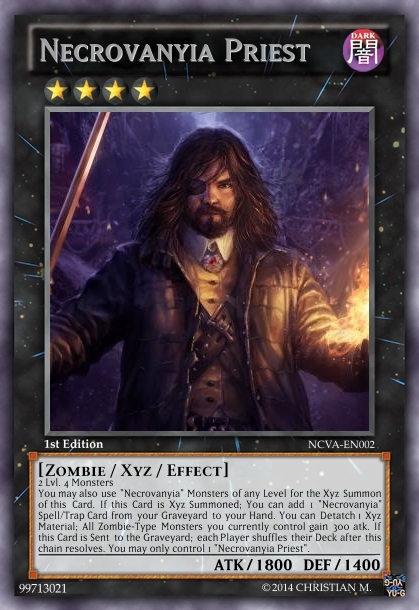 You may also use "Necrovanyia" Monsters of any Level for the Xyz Summon of this Card. If this Card is Xyz Summoned; You can add 1 "Necrovanyia" Monster from your Graveyard to your Hand. You can Detatch 2 Xyz Materials; Shuffle up to 2 "Necrovanyia" Card(s) from your Graveyard into the Deck. During your Main Phase, while this Card is in your Graveyard: you can Target 1 Monster you control; Tribute the selected Target, then Special Summon this Card from your Graveyard in Defense Position. If this Card is Sent to the Graveyard; Each Player shuffles their Deck after this chain resolves. You may only control 1 "Necrovanyia Wicken". 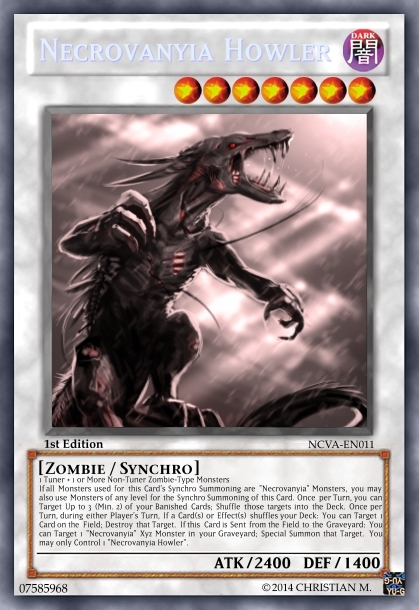 If all Monsters used for this Card's Synchro Summoning are "Necrovanyia" Monsters, you may also use Monsters of any level for the Synchro Summoning of this Card. Once per Turn, you can Target Up to 3 (Min. 2) of your Banished Cards; Shuffle those targets into the Deck. Once per Turn, during either Player's Turn, If a Card(s) or Effect(s) shuffles your Deck: You can Target 1 Card on the Field; Destroy that Target. If this Card is Sent from the Field to the Graveyard: You can Target 1 "Necrovanyia" Xyz Monster in your Graveyard; Special Summon that Target. You may only Control 1 "Necrovanyia Howler". 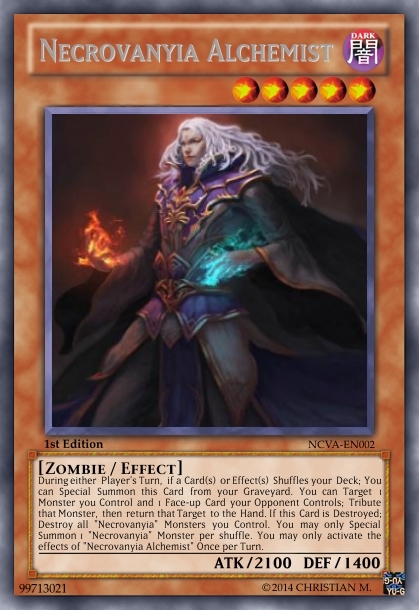 Once per Turn, During either Player's Turn, If the effects of a "Necrovanyia" Monster that activates on the Field would resolve; You can make each Player shuffle their Deck after that effect resolves. Once during either Player's Turn, If the Deck(s) is shuffled by a Card(s) (except by this Card's effect); you can increase the atk of all Monsters you currently control by 500 until the End Phase. If this Card would be Destroyed, you can Tribute 1 Monster you Control instead. 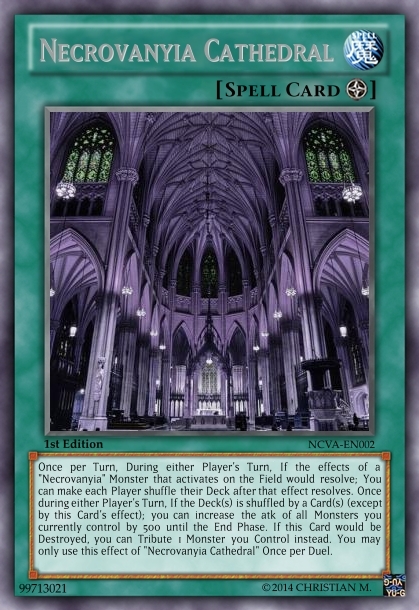 You may only use this effect of "Necrovanyia Cathedral" Once per Duel. 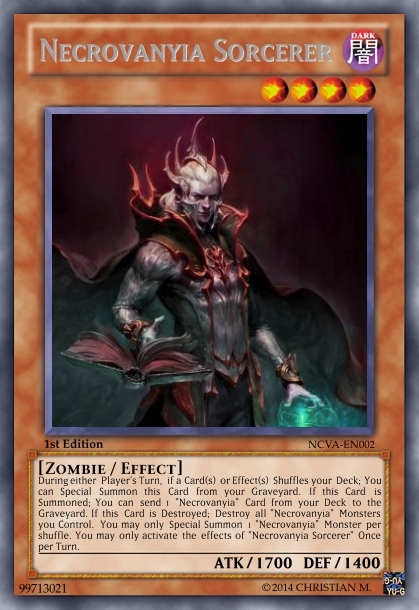 Excavate the top 4 Cards of your Deck: If you excavate a "Necrovanyia" Card, you can Special Summon 1 "Necrovanyia" Monster or Normal Summon 1 "Necrovanyia" Monster in addition to your Normal Summon/Set by Banishing all excavated Cards that do not have "Necrovanyia" in their name (you may only gain this effect once per turn). 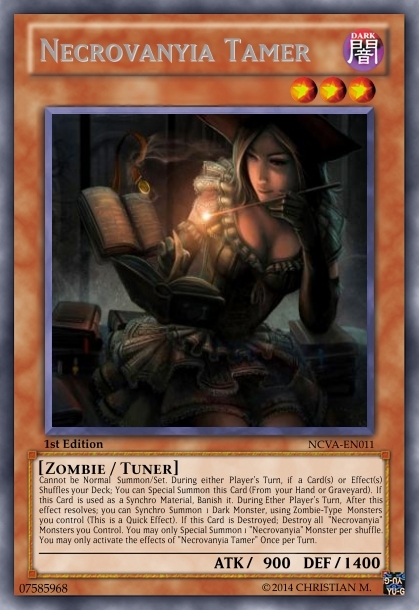 Send any "Necrovanyia" Cards excavated to the Graveyard, then, if you did not Summon a "Necrovanyia" Monster from this Card's effect, shuffle the remaining Card(s) into the Deck. You may only activate 1 "Necrovanyia Sacrifice" per Turn. Each Player shuffles their Deck after this Card's effects resolve. 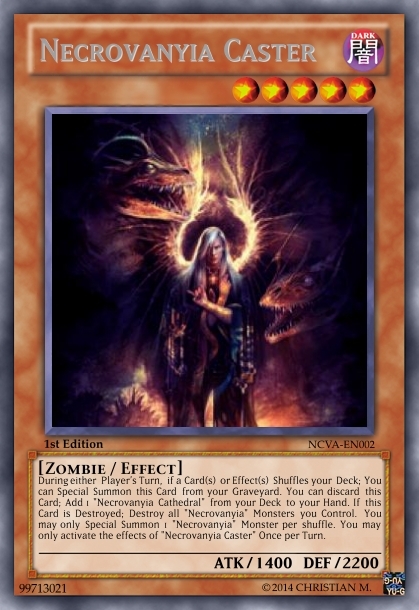 If a "Necrovanyia" Card(s) you control would be Destroyed (either by battle or by card effect): You can discard 1 card or Tribute 1 Monster you control, then add 1 "Necrovanyia" Card from your Deck to your Hand. Each Player shuffles their Deck after this chain resolves.